The Honda Center’s massive technology upgrade includes a new HD scoreboard, HD video cameras and completely renovated video and audio rooms. 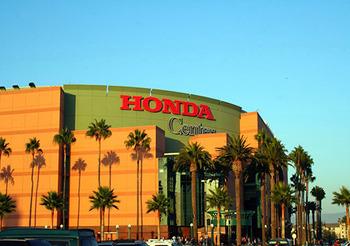 To ensure that the right audio solution was chosen, the Honda Center’s audio team worked with audio-visual (AV) systems integrator Diversified Systems, which drew on its decades of expertise consulting, designing, building and integrating full-scale audio solutions. The complete audio solution for the Honda Center includes 72 JBL VTX V20 loudspeakers and 30 Crown I-Tech 4x3500HD amplifiers. JBL loudspeakers are set up in six clusters, each configured with 12 JBL VTX V20 line array cabinets with four subwoofers behind them. HiQnet Audio Architect™ software was chosen for sound system configuration, and the JBL loudspeakers and Crown amplifiers are easily configured, monitored and controlled using JBL HiQnet Performance Manager™, a software application that facilitates a more streamlined workflow. In choosing a new audio system, Honda Center sound technician Nate Chivers wanted a significant upgrade in the evenness of sound coverage, so every seat would feel like it was right on the ice. The HARMAN Professional Solutions installation also led to a substantial improvement in microphone directivity. Chivers is not alone in his praise for the HARMAN Professional Solutions system.